Growing up, we always had a veggie garden. We also had a small variety of fruit trees on our suburban lot, including several red currant bushes. So, it’s not unusual that I also have two currant bushes in my garden, one red and one white. I religiously harvest the red currants (late June) and sometimes not very often, the white currants. I was told by a ‘professional chef’ that the white currents do not have much flavor compared to the red currants!? Well, I don’t know about that, because I think the white currants are actually a bit sweeter (than the red) and produce a pale pink ‘jelly’. Perhaps the pink/light blush colored currant jelly isn’t as appealing/traditional?? But, I digress! Earlier this month, I picked enough red (and a few white) currants to extract the juice for three ‘future’ batches of jelly. 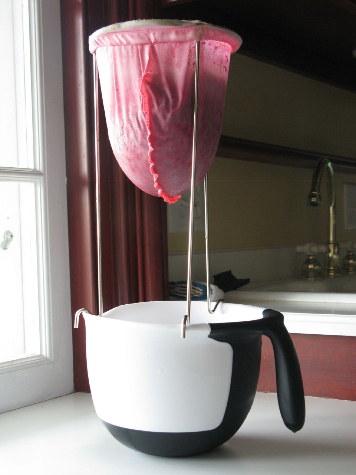 In all my years of jelly-making, I have never used a jelly bag! I’ve used kitchen towels and layers of cheese cloth which time-and-time-again simply ‘blinded’ and made a mess of everything. 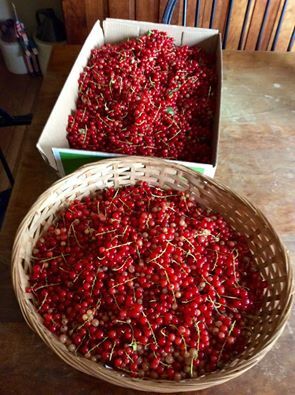 Red currant harvest from one bush. I finally surrendered knowing that my red currant jelly would never receive a blue ribbon (for lack of clarity) at the Fair. Instead, I typically use a food mill to obtain the juice (and some pulp which coincidentally contain all the good health essentials… according to my sister) and a fine sieve to catch any wayward seeds. The remaining ‘juice & pulp’ is delicious nevertheless (but, definitely NOT the gorgeous clarity of red currant jelly)! Most recently, I picked the last of the remaining ripened red (and a few white) currants. 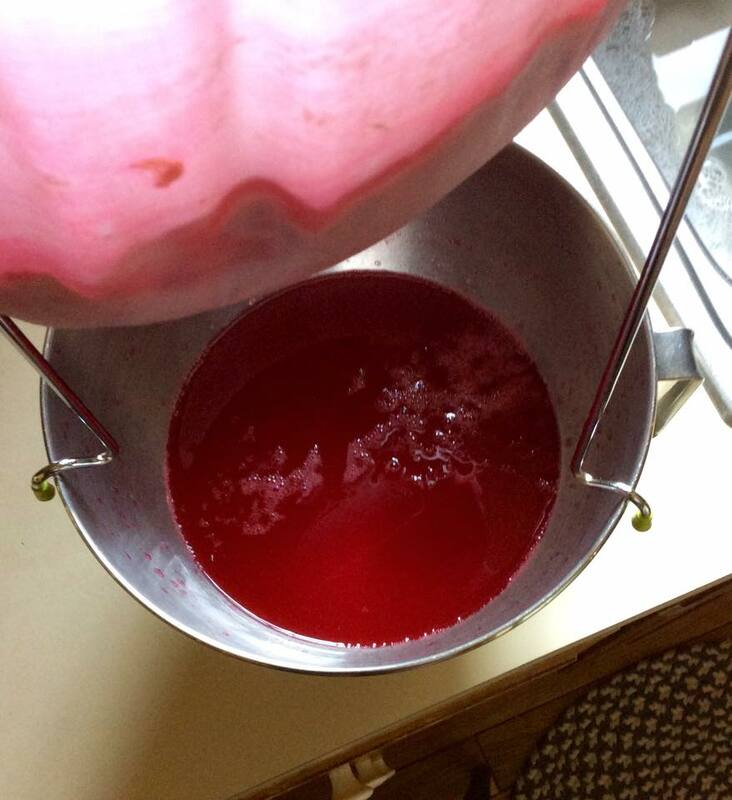 I honestly did not believe I would have enough JUICE to make another batch of red currant jelly! 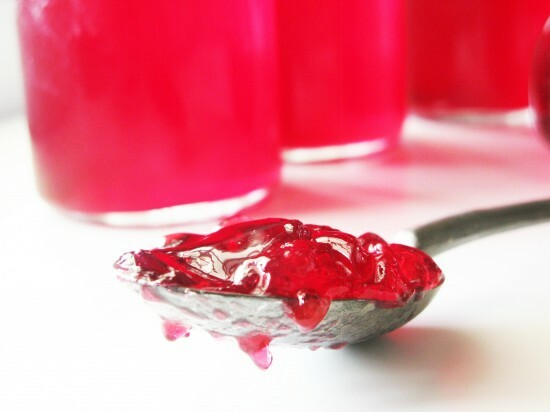 I began to investigate the history of red currant jelly and look for alternate recipes. I found an interesting read at Beekman1802 here. 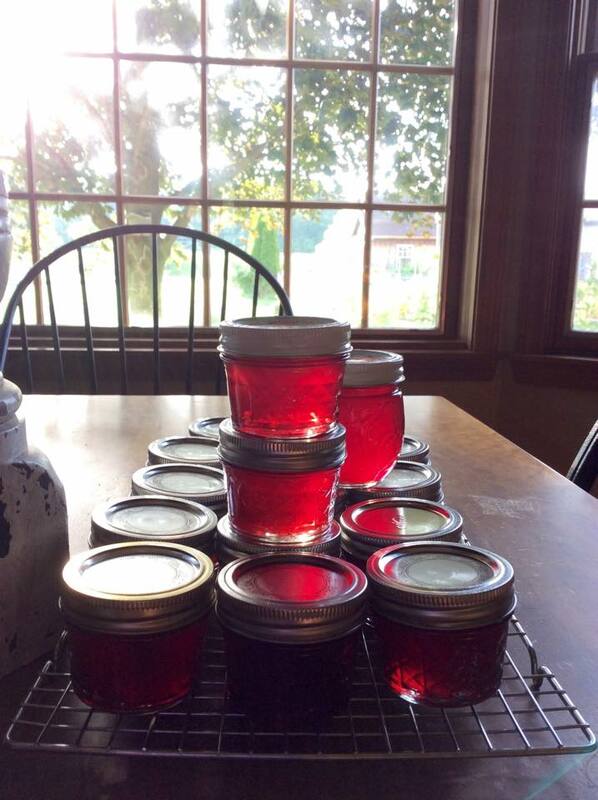 Josh and Brent have a wonderful article about red currant jelly and their recipe here. Then I thought +++WINE+++. I thought about a locally cultivated Michigan wine (versus a commercially manufactured grape or apple juice) that would compliment my red currant elixir?? I’ve seen a lot of wine jelly at craft shows in recent years… so, why not add a bit of wine instead? Another recipe/how-to search ensued. 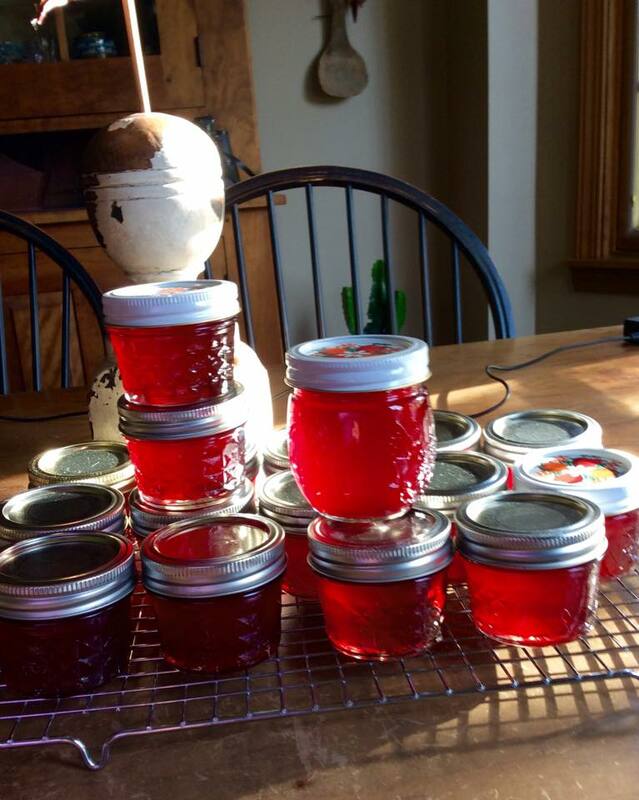 Wine jelly recipes abound and was simple enough for a well-seasoned jelly-maker like moi! Here’s one using a Riesling wine! Next, I barred no expense!! Since this was going to be a supreme fancy red currant jelly, I decided to purchase my first jelly bag (just like Josh and Brent)!! But, I found my jelly bag at Meijer for $6.99. WOOT!! Next, I prepared my red currants by removing the stems and giving them a gentle wash (any missed leaves, etc, float and can be easily removed). 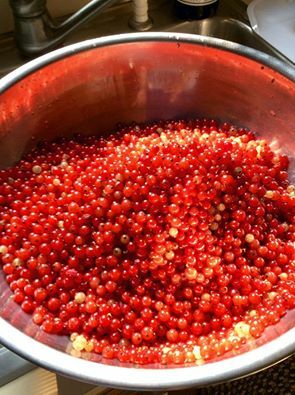 I actually followed the Beekman1802 recipe to make my jelly… I actually had eleven cups of red currants (more than the requisite 10-cups). 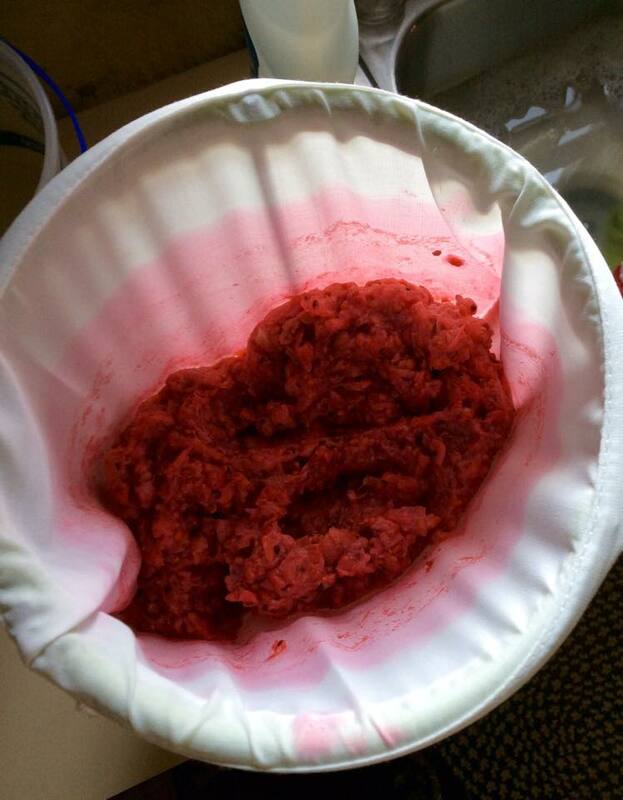 After allowing the juice to drain overnight, I measured only four cups juice. BOO!!! 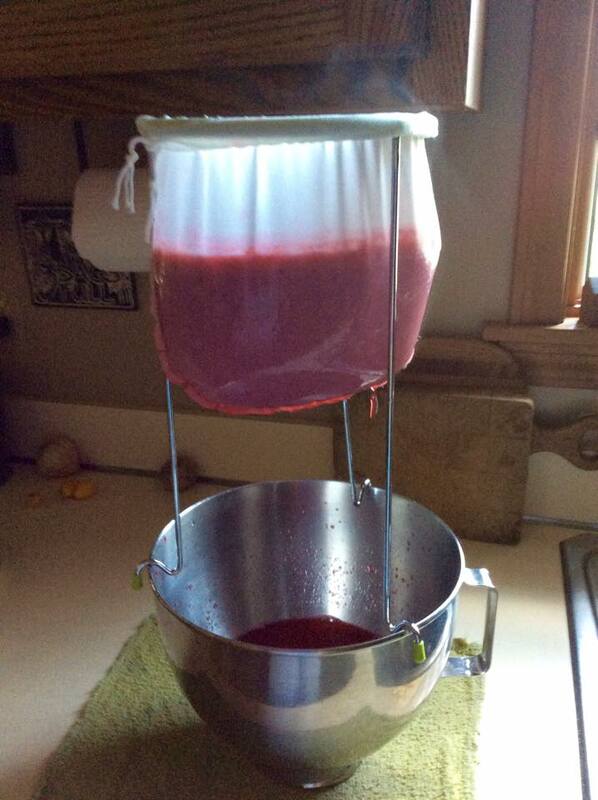 I would need an ‘award-winning’ local Michigan wine to supplement my red currant juice for the jelly recipe! I selected a red wine from Chateau Grand Traverse also found at Meijer! 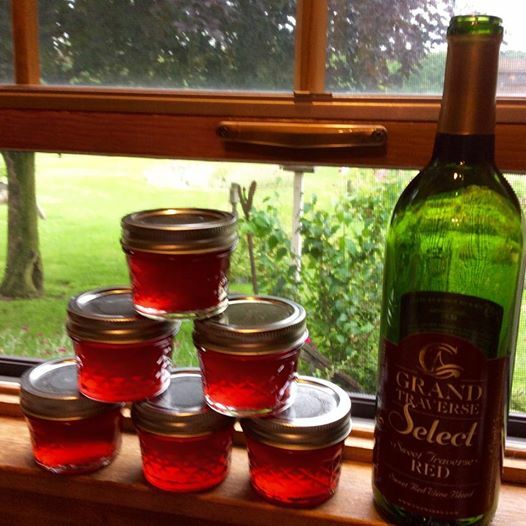 The Mr., my mom (who’s 90 years-old) and myself had a great evening making our ‘fancy’ red currant & wine jelly (about an additional 2-cups of wine was necessary)… and enjoying the rest of the bottle of Select Sweet Traverse Red wine! So good!! Lovely red currant (and wine) jelly! Something homemade and delicious to go with our farmstead goat cheese!! BEFORE, my busy little herb garden… no more! 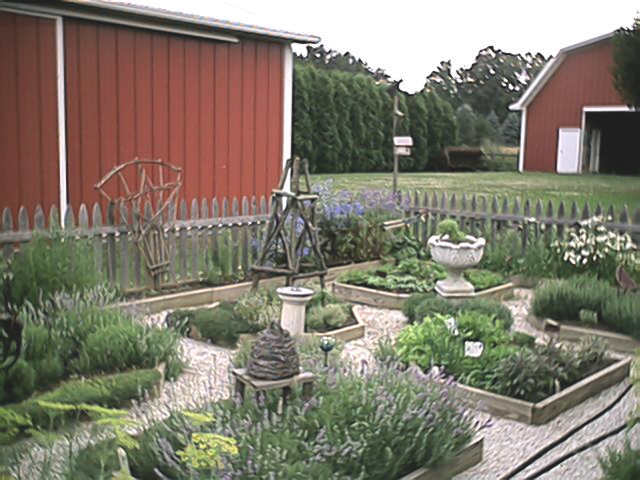 My somewhat f o r m a l herb garden (located off my farm workshop) is was intricate and very ‘busy’. The footpath/aisle was really too narrow for a wheel barrow. 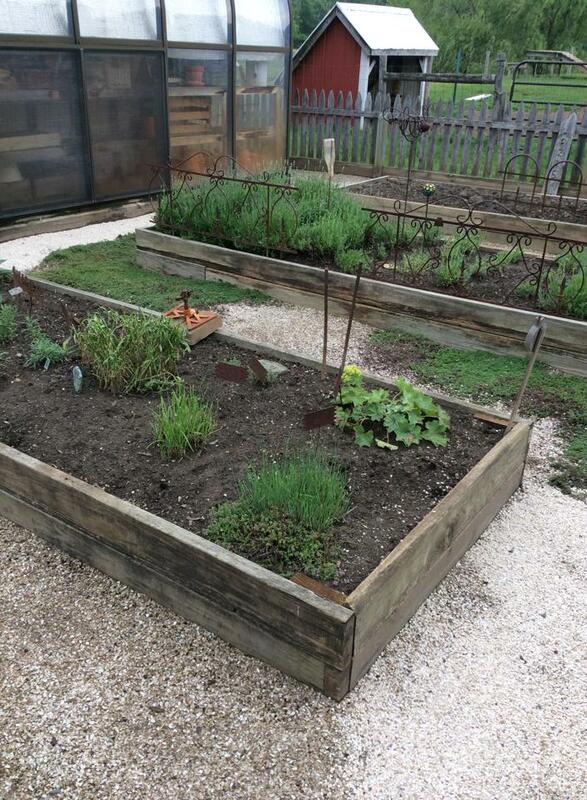 The raised beds consisted of six main ‘gardens’ with a smaller ‘diamond’ focal point in the center. 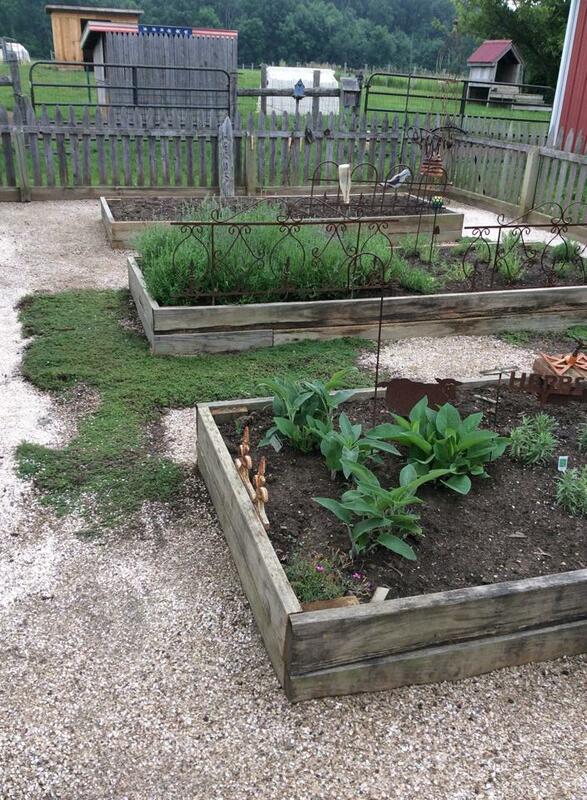 I also had raised beds around the entire perimeter/fence line. It was jamb-packed!! Over time, it became the proverbial 10-pounds in a 5-pound sack! TOO much going on!!! Isn’t is funny how our ‘tastes’ change over time? Whether in home decor, lifestyle, hobbies, etc? Perhaps attributable to age and experience… mostly AGE??? The little voice whispering… be kinder and gentler to yourself. The realization and hopefully acceptance of the fact that YOU can’t do it all as much as you used to?!? Priorities shift… and life changes along the way. To that end, we ‘re-worked’ my herb garden. The raised beds needed a little help, definitely showing their age and effects of winter freeze, heave and thaw! AFTER, my herb garden. Key feature: S I M P L I F Y !!! 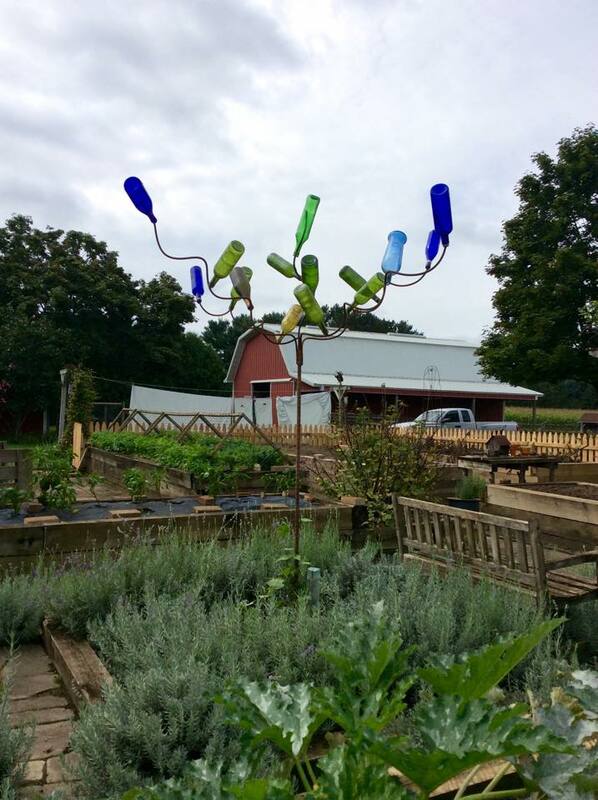 We worked within the existing footprint of the garden and re-used ALL of the salvageable lumber! Only two new additional boards and additional oyster shell (for the path) had to be purchased for this make-over! YAY! It was a matter of staging: transplanting herbs, tearing down the old and replacing with the new. One garden box/bed at a time! Oh my, the number of herbs I tossed into the chicken’s scratching pen!! I kept ~ ONLY ~ one small existing garden bed as is, near the front gate entry. 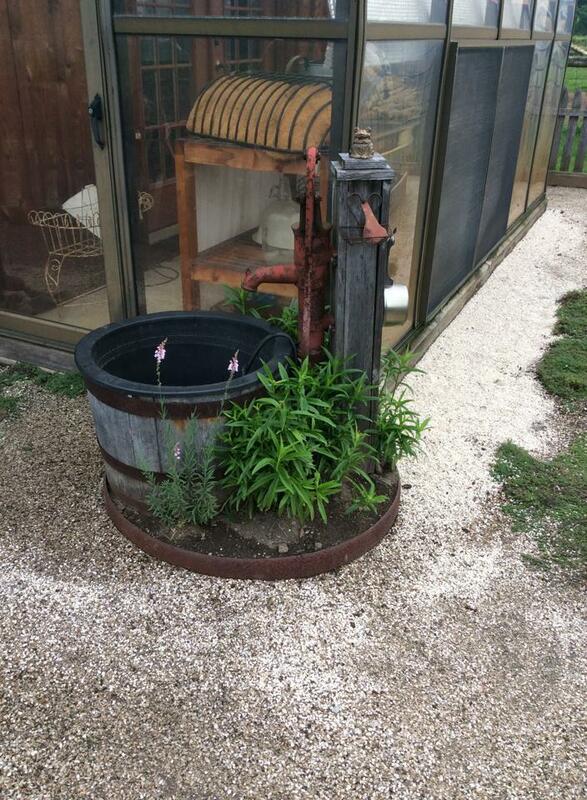 I also opted for THREE raised beds centered in the existing space (if you don’t count the well head/water feature). However, I did re-construct taller garden boxes, two boards high (instead of one). Another view of my ‘new’ herb garden. It feels good. De-cluttered and simplified… an acknowledgement/acceptance of a lifestyle change. Thanks to my dear husband :: who without his enduring love [and tolerance] :: nothing would be possible! The past week has been both busy and productive! Memorial Day weekend is ~ traditionally ~ the big push to get the garden planted… safe to presume there’s no longer a threat of frost here in Michigan!? I’ve been weeding, purchasing seeds/starter plants [tomato and green peppers] and amending the soil with more compost… to make-ready for the actual planting. Most of the planting was performed by my husband, Katie (who’s home for the summer) and Matt and his girlfriend, Sam. Many hands make light work!! 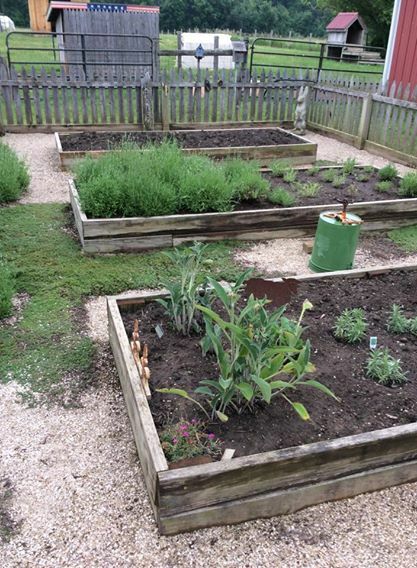 We have a small [but productive] vegetable garden consisting of raised beds. 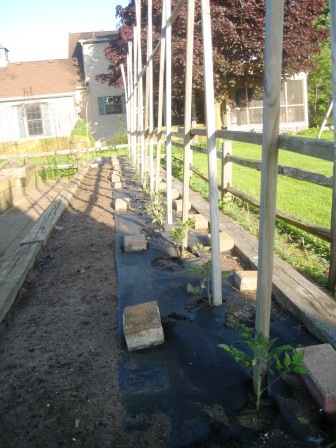 The Hubs prefers to grow tomato plants on a ‘trellis’, keeping the fruit off the ground. Bush beans are planted opposite the tomatoes. I have yet to plant a few more veggies (winter squash I think) in the remaining open space. Next up, replace the split rail fence [that currently encompasses the veggie garden] with a picket fence – a more goat kid-proof alternative now that the garden is ‘occupied‘! 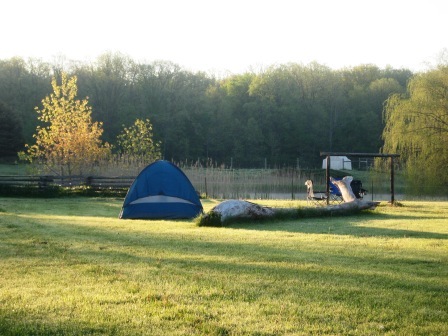 It was a beautiful weekend for bonfires and camping in the backyard! 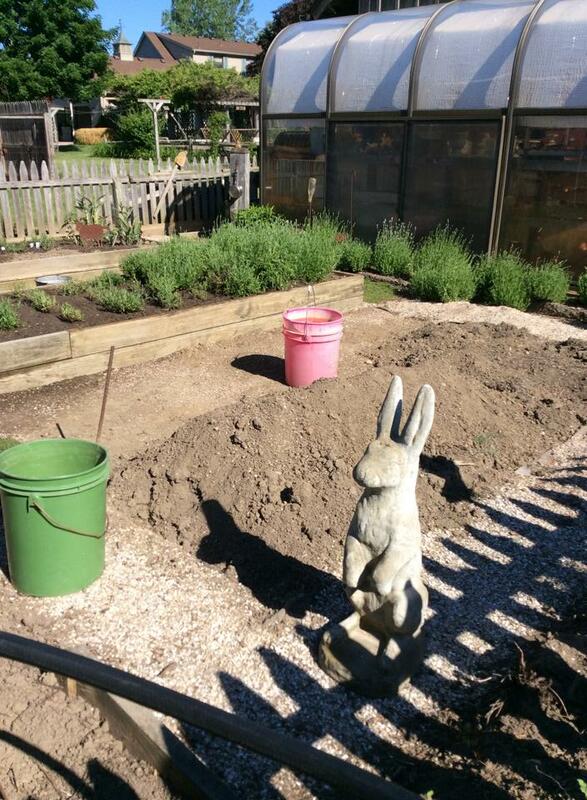 Also in the works… my herb garden make-over. 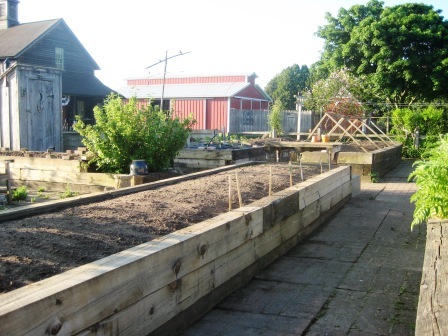 The raised beds, after many years of service, require re-building too. I thought I’d take advantage of this opportunity to also re-design/simplify the herb garden. Fewer beds and less congestion in the existing footprint. More on that as we make progress. 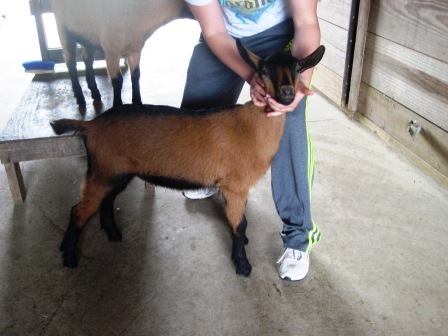 The lambs [all eleven of them] and goat kids are growing well! Can you believe the Oberhasli kids are 8-weeks-old today!? This is Gendry, the buckling, who will probably be castrated/wethered soon [since I’ve had no ‘nibbles’ in potential sale as a herd sire]. 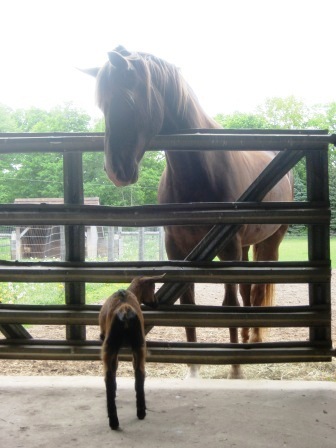 Here is a photo of the doeling, Arya, with Katie’s horse, Neo. 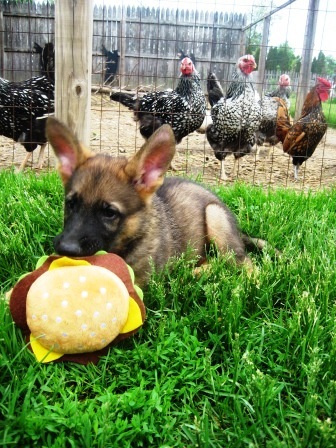 NOM NOM NOM… Mama said we can have a little grain now that we’re old enough! 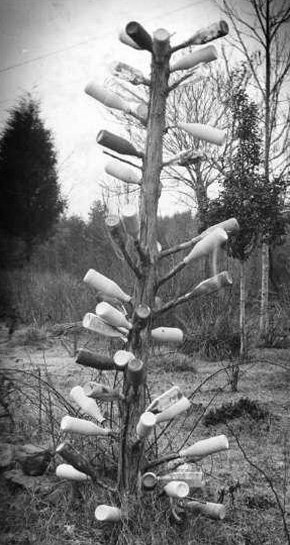 They’ll still get a bottle as long as they’re here… at least for now. Looking for good homes for both Arya and Gendry!! 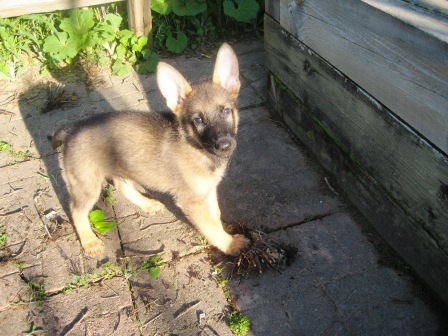 Last week we also welcomed a new member to the family: Katie’s German Shepherd puppy, Zeak. Zeak, helping me ‘weed’ the garden! Almost 9-weeks old and a FULL-time babysitting job! Whoa! He needs to grow into those ears!!! He’s a busy little farm dog and will be a great companion for our rescue dog, Thunder! At the present time, Zeak is enjoying limited house-life… until he’s a bit older [and bigger]. 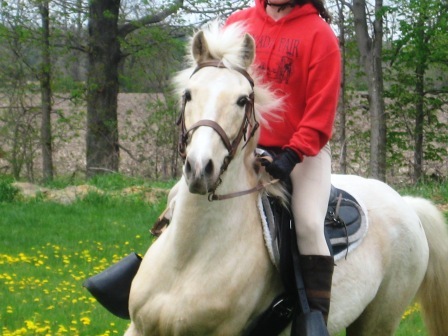 Katie and Nash enjoying a ride! Happy trails!! Hello my dear friends! It has been a R-E-A-L-L-Y long winter here in Michigan (and all across the US, for that matter!). March 1st dumped several more inches of snow and another round of (all too familiar) record-breaking/below zero frigid temps this past weekend. 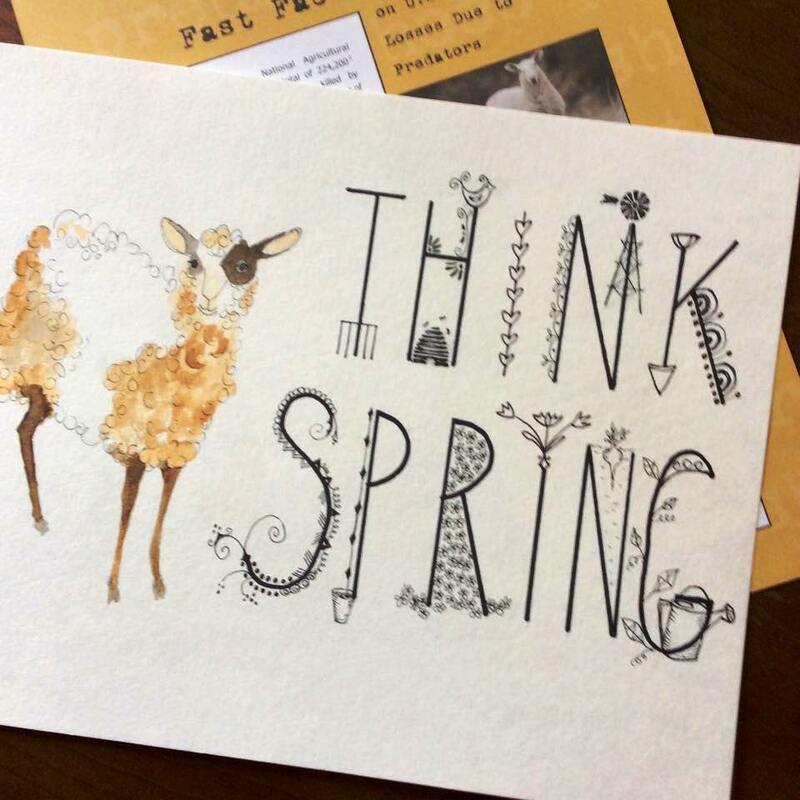 I think we are all disheartened… lacking ANY evidence of Spring’s arrival any time soon!?? We have snow/ice piled up higher than I am tall!! However, Spring has certainly arrived in other parts of the country… as evidenced by photos of green grass, beginnings of greenhouse plantings [I can almost smell the earth] and babies, babies, babies everywhere! Thank goodness for my daily dose of visits to blog posts, fb, pinterest, tumblr and other social media resources!! You have SAVED me! On the farm this past weekend, I finally took down my make-do/temporary sheep breeding pen(s) and re-united the hopefully prego ewes with the rest of the flock. Potentially more dramatic, the rams have been re-introduced as roommates! I am totally thankful for the advice of a shepherd friend, to confine the rams – in the smallest space possible – to the point where they are almost immobile. In addition, food/water are withheld for 24-hours! Upon their release, they pretty much lose ‘interest’ in each other and go direct to eating with very little squabble! Happy sheep! Speaking of happy sheep, I recently sold my remaining yearling wether as a ‘pet’. YAY! Saved from the freezer!!!! 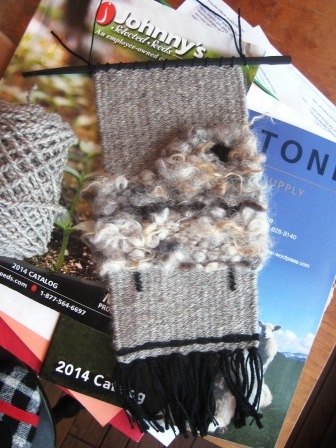 Continuing the Spring ritual, sheep shearing has been tentatively scheduled sometime later this month. 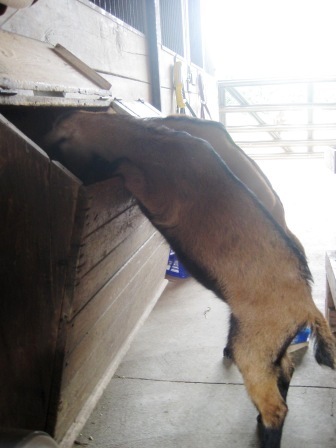 It’s also time to prepare for kidding/lambing, vaccinating mama’s and taking note of any necessary ‘supplies’. After a long wait, it’s best to make plans… not to be caught off-guard or surprised by this blessed event! So, while I anxiously await Spring, I continue to play with fiber (explore weaving ‘smalls’ with a lap loom) and work on my garden wish list!